This one can *easily* live on bread (and cheese) alone. On Sunday I went all ‘touristy’ on Paris and had a fantastic day! 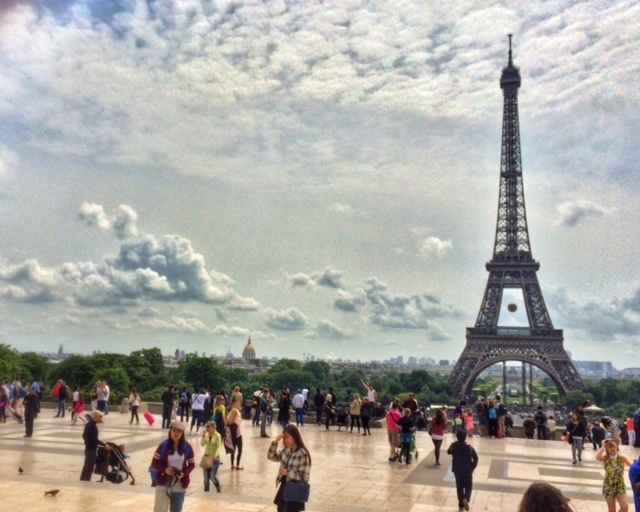 I believe the best first sight of the Eiffel Tower is from the top of the hill at the Pallais de Chaillot. You get off at the Trocadero metro stop, and there it is, framed so elegantly by this majestic structure and gold statues. I almost got to the Louvre, but decided to save that exploration for the first Sunday of the next month, when it will be free admission- totally worth the wait (and you’d be surprised how quick it is if you get in line (aka ‘cue’) before mid afternoon). I plan to check out another couple museums that Sunday as well! It will be great when my sister and mum join me in July- they get here the day before the first Sunday in July- so we can jump right into Paris museum craziness their first weekend in town! I took photos for a few people struggling to take a selfie as i walked along the Seine- I pretended to be a local, and only spoke in French- to some French speakers and some English speakers. I will continue to work on *my* ‘selfies’, but until I get better you do not get to see my awkward bad-angle photo with me squinting, under- or over-smiling with my head far too close to the camera, and the item I hope to showcase almost off-camera. Just: no. I bought a museum passeport to the Musee D’Orsay and the L’Orangerie. I can easily say that the Impressionist time period is my favourite kind of art, and the D’Orsay exhibit with Degas, Manet, Cezanne, Monet, among others, was my favourite. I can’t wait until we head out to Giverny to see Monet’s garden that inspired the water lilies! It was then I decided to head to Montmartre, my favourite arrondissement of Paris, picked up some Brie and a baguette, and sat on the hill below the Sacre Coeur to have ‘mon diner’. Delicious. Now, Montmartre will get its own blog entry, because I have that much to say about it!! 🙂 To make it brief, I people watched, explored many of my favourite and several new-to-me shops, was bought a cafe au lait and chatted up (in French) by a Parisian bloke for almost an hour, bought a mango gelato and wandered by an outdoor theatre performing Servant of Two Masters (en Francais, bien sûr !) and I wish I has been there from the start! Even though the actors spoken quickly, the physicalizations were very clear, and I had a good idea of what was going on, and it was very funny! It was their closing night, so I wont be able to see it again in full, sadly. Eiffel Tower? Check. Croissant? Check. Museum? Check. Jardin des Tuilleries? Check. Bread and cheese dinner? Check. Montmartre? Check. Coffee with a handsome stranger? Check. Theatre? Check. Day 2? Good day! ← Day 1… Or is it Day 0.5?